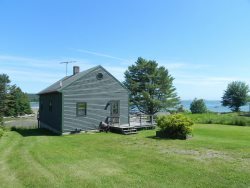 Sitting a mile off the main road, this lovely waterfront home offers beautiful sunset views across John’s Bay. Comfortably furnished and well cared for, this home offers water views from nearly every window. The open deck is large and sunny and expands your living space with new outdoor furniture. This location is quiet and secluded, with scattered cottages dotting the coastline. The waterfront is large with a dock and float to enjoy, along with an adjacent cove for swimming or kayak launching. Bedrooms & Bed Sizes: . Tanya is great. I especially appreciate how willing she was to find a place that would take our dogs. Three weeks in heaven. I did not want to leave.